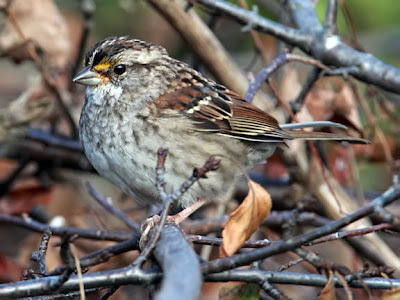 Zonotrichia albicollis, or the white-throated sparrow, is an emberizine sparrow that can be found in the eastern half of North America. 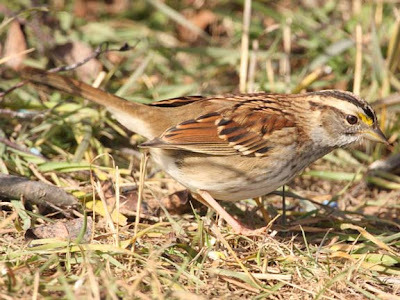 White crowned sparrows breed in eastern Canada and the north central and north eastern United States. They winter in the eastern United States as well as parts of California, Arizona, New Mexico, Texas, and northern Mexico. There are two different color morphs of the white-throated sparrow,the tan crowned white-throated sparrow and the white crowned white-throated sparrow. Unlike birds such as cardinals the color of the white-crowned sparrow does not identify whether it is male or female. There are males and females of both color phase. The reason why both color phases continue to exist is because all males tend to prefer white crowned females and all females tend to prefer tan crowned males. Are you sure about the identification of the first photo? Such a little guy to have such a big fancy name. We see those sparrows around here all the time. I can attest that we do have these little birds here in Deep East Texas! I've managed to get a few pictures of them. Good choice for Z. No matter how many exotic birds I see or hear about, I still love sparrows. We don't get these guys in Alberta, and they sure are cute. Very cute pictures ! Nothing for my cats though, lol ! Well, I am seeing both varieties in my back yard! I love these little birds!